For those of you that know me, I am not big on resolutions. I just don’t believe they work. What I do at the beginning of every year is set intentions. These are things I intend to do in the year and more often than not, I get through the list quite nicely. This year, my hubs and I both wanted to set the intention of honoring ourselves. We are so busy and our schedule is VERY much dictated by a child that wants to be an Olympic athlete. We never found the rings we really wanted when we got married but when we saw these, we knew those were the ones! The bands are from monkeysalwayslook on Etsy. The outside shows the longitude and latitude of where we got married. On the inside we took pieces of a Viking quote for both. The full quote says “Love conquers all, let us yield to love” so mine is inscribed Love Conquers All and his is Yield To Love. They were just perfect for us. 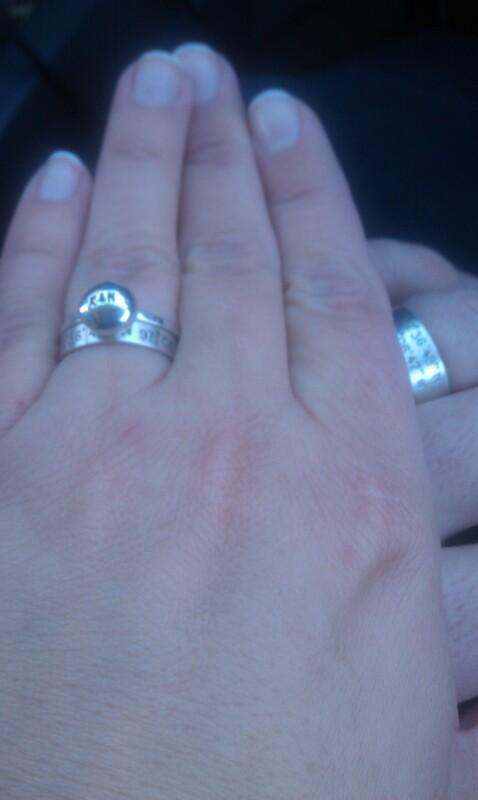 My engagement ring is also from an Etsy vendor, silvercoinrings and is a Dime-On-Ring. It is a dime melted onto a ring and stamped with initials. We had K & M stamped in. I would highly recommend both vendors as they were easy to work with and all about making sure everything was perfect! So what intentions do you have for the year? I STILL need to get busy on learning to sew!